In actuality, the map undoubtedly originated from a Victoria 2 base-map, as it is structured around the same idiosyncratic regional divisions used in the game; this can be seem by examining an actual map connected with the game, posted here. 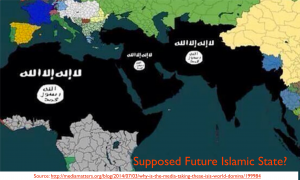 Apparently, an amateur cartographer has simply taken a Victoria 2 map and blackened in all of the regions that he (or, unlikely, she) envisages as future portions of an enlarged Islamic State. In doing so, the mapmaker reveals his own ignorance of the geography of Islam, as a number of important Muslim areas are excluded from the realm (such as Xinjiang in northwestern China), while a number of non-Muslim (and never-Muslim) areas are included, such as Burma. Little is anything can be inferred about the visions of ISIS and its supporters from this map. Alex Jones, after all, is “often described as America’s leading conspiracy theorist,” according to the Wikipedia, and thus there is no telling where the map actually originated. I find the map interesting, however, because it shows the significance of game-oriented fantasy geography for perception of the actual world. In general, I strongly support geography- and history-based games, as they can be a fantastic way for students to learn the basic structures of the world. Pedagogical scolds often tells us that learning basic facts is intellectually stultifying, as it relies on “rote memorization,” but the process can just as easily be accomplished from playing games, as long as the games in question are adequately connected to the real world. 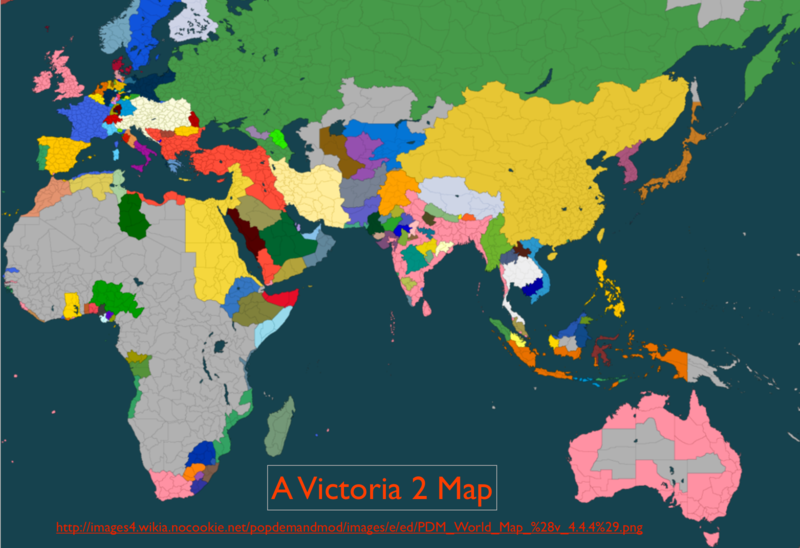 From what I have seen of Victoria 2, the historical mapping used in the game is sophisticated and relatively accurate. But that still does make it a serviceable base-map for geopolitical aspirations or fantasies. In the end, it is best to reserve gaming maps for gaming purposes.